JailbreakMe, a new web-based jailbreak has been released, offering users of Apple's iOS devices, including iPhone 4 and iPad, a simple tool to open up their devices for installation of non-Apple-approved applications, customizations, and file access. 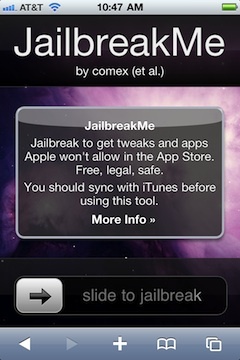 Users need only visit the JailbreakMe.com site with their iOS devices and activate the "Slide to Jailbreak" switch to open up their devices. Jailbreaking remains officially unapproved by Apple and the company warns that any device issues caused by the jailbreaking process could violate the warranty. The company also argues in a support document that jailbreaking can cause "instability, disruption of services, and compromised security." Consequently, users should proceed at their own risk, despite that fact that the jailbreaking process is easily reversible by restoring through iTunes. Just last week, the U.S. Library of Congress issued a specific exemption to the Digital Millennium Copyright Act to allow smartphone users to jailbreak their devices without running afoul of the legislation.